As a California forklift accident attorney, I know that these incidents happen all too often throughout our state from urban areas like Los Angeles to more rural settings like the San Joaquin Valley and other agricultural areas. According to the Occupational Safety and Health Administration, an average of 34,900 people are injured and 85 are killed in powered industrial truck accidents in the U.S. every year. There are some common scenarios that happen in accidents involving these machines, and many could be avoided with preventative measures. If people are injured or killed in accidents involving a powered industrial truck, an experienced personal injury attorney may be able to help them recover compensation through several causes of action. There are several common scenarios involved in forklift accidents. Drivers who lack the proper training or who are not certified are often involved in these accidents. Operating the truck with a load that is not properly balanced or unsecured is also a common cause of accidents. Operating powered industrial trucks with an elevated load causes accidents each year across California and the U.S. Negligent operation of the trucks may result in serious accidents, including speeding, horseplay and giving rides to others. Finally, accidents may happen when the machines are not properly maintained or have some type of manufacturing defect. Forklift accidents may happen in many different locations, but there are several at which they most commonly occur. 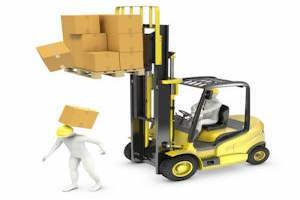 Manufacturing warehouses that have many workers on the ground around forklifts are common locations of these accidents. Big box retail stores that have goods stacked on high shelves also are frequent sites of these accidents. Loading and unloading docks of freight delivery facilities are areas where powered industrial trucks are often used, and they are also sites of many accidents involving them. Construction sites also frequently have accidents involving forklifts occur. When accidents involving powered industrial trucks happen, they may give rise to several potential causes of action. An experienced personal injury attorney may analyze what happened in order to determine the legal claims that might be available to a client. If accidents happen at the victims’ workplaces, they may recover benefits through their employers’ workers’ compensation insurance coverage. California employers are mandated to carry this type of insurance in order to protect their workers. Statutory employees are covered by workers’ compensation if they are injured while they are working. They may recover benefits to pay for all of their related medical expenses, rehabilitation costs and a portion of their former incomes if they are disabled by the accident and unable to work. The families of workers who are killed in workplace accidents may recover benefits to pay for their reasonable funeral and burial expenses as well as ongoing monthly benefits to replace a percentage of their loved ones’ former incomes. The employer’s hiring, retention or supervising of the operator was a substantial factor in what occurred and the resulting harm to the plaintiff. If the accidents resulted because of product defects, all of the parties involved in bringing the powered industrial truck to the market along the chain of production may be liable to pay damages in a resulting lawsuit. Manufacturing defects happen during the manufacturing process. Plaintiffs must prove that the machines were manufactured with defects, that those defects happened during the manufacturing process and existed when the machines were sent to the market. They must then show that the defect resulted in the accident that caused them harm. Plaintiffs may also have claims against sellers under the implied warranty of merchantability. Under this theory, plaintiffs must show that they purchased the machines from the defendants, that the defendants were in the business of selling the machines, that the machines contained some specific defects, that the plaintiffs took reasonable steps to notify the sellers that the machines did not meet the quality standards and that the defects caused the plaintiffs harm as a result. Powered industrial truck accidents including forklifts and other machinery may cause catastrophic injuries to people. When victims are injured in such an accident, they may have several legal claims available to them. An experienced lawyer may work to identify all of the legal grounds that may be available in a lawsuit in order to maximize the potential recovery. Contact an experienced personal injury lawyer to schedule your contact us and to learn more about the rights that you might have.